I posted this story and make-ahead technique to my Instagram account recently, only to be cut off part-way through when I exceeded the word limit. As Stephanie Tanner would say: How rude, lol. Did you even know that Instagram has a word limit? I guess it wasn’t designed for Chatty Cathy’s like me. That’s when it hit me: I should post this on the blog so I can go a bit more in-depth! So read on, my friends…. Adriana, three years old: “NO THANK YOUUUUUUU” (as she skips away with Arlo’s favourite toy in her grasp). Spotted 10 minutes earlier: downing a box of “circle crackers” (sigh). Arlo, one year old: *Screams and beats his hands in protest because he has to wait for the squash to cool* then proceeds to inhale it. He was nice enough to smash the leftover squash into his hair, and even tossed some over his shoulder for good luck. Me: *Scream and beat my hands in protest because I have to wait for it to cool* then enjoys two big servings. You know the saying…as far as anyone knows, we’re a nice, normal family. Bahaha. You may have noticed lately that I’ve been on a crusade to create as many time-saving recipes and make-ahead tips as I can. 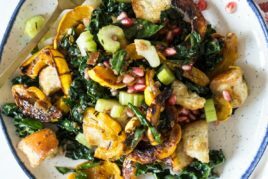 In recent posts, I shared Adriana’s Favourite 10-Minute Pasta, 8-Minute Pantry Dal, and Make-Ahead Thanksgiving Panzanella, to name a few. 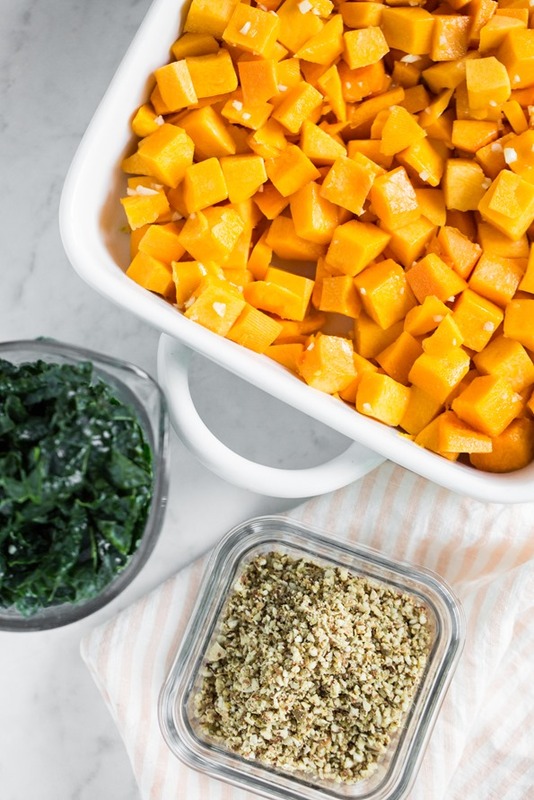 Last week, I came up with a make-ahead version for one of my favourite side dishes: Roasted Butternut Squash with Pecan Parmesan and Kale! I’m so excited to share how I tweaked the original recipe to minimize day-of prep time. Now that we’re getting into all kinds of holiday celebration meals, my goal is to share as many time-saving tricks with you as I can. It’s making life much less hectic in the Liddon household. 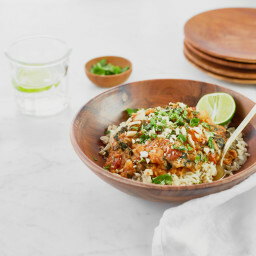 I discovered that this dish can be prepped and stored in the fridge two to three days in advance—and no one will be the wiser! This is a fun trick for holiday meal prep when sanity reaches an all-time low (or is that just me?). 1) Combine the chopped squash, minced garlic, parsley (not shown in the photo! ), oil, and salt in an extra-large casserole dish. Pro tip: if I’m really short on time, I’ll occasionally buy fresh pre-chopped squash to save the hassle of peeling and dicing a large one! Sometimes you just gotta live your best life, ya know? 2) Stem and chop the kale, then place it into a zip bag or container. 3) Make the vegan parmesan, and place that into a separate fridge-friendly container. When you’re ready to roast this beauty either later that day or as many as two to three days later, proceed with the recipe as usual…maybe while giving an evil cackle about how you outsmarted the original instructions. I won’t mind. One thing’s for sure, I’ll be using this trick for all of my future holiday meals, and even busy weeknights! It’s so handy to have everything prepped and ready to go. I hope this tip helps streamline your own holiday meal planning as well. If you’re looking for more crunch-time holiday inspiration, don’t forget to check out my Make-Ahead Thanksgiving Panzanella recipe—it has had some great feedback so far. Oh, and let me know in the comments if you have any make-ahead recipe requests! I’d love to hear them. This is a handy make-ahead version of one of my all-time favourite fall and winter side dishes showcasing the best of cold weather produce. See my tips below on how you can prep the casserole ingredients a couple days beforehand, so they’re ready to come together effortlessly at meal-time (just be sure to leave yourself about an hour to cook it, though). Sometimes, when I’m feeling wild, I like to double the vegan parmesan because it’s just so good! 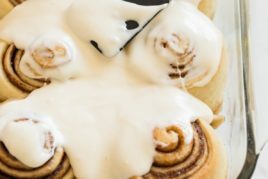 This recipe is adapted from the original in 2012—back when I had a little more time in the kitchen, pre-kiddos! Grease an extra-large casserole dish with oil and set aside. 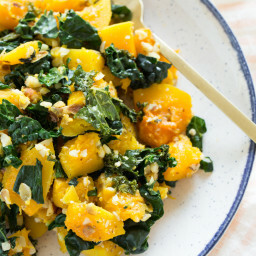 Add the minced garlic, parsley, oil, and salt into the casserole dish and toss with squash until combined (hands or a spoon both work well for this step!). Do not add the kale yet. Cover the casserole dish with tinfoil and pop it into the fridge. Place the chopped kale into a tightly sealed zip bag (being sure to squeeze any air out beforehand) or a small airtight container and refrigerate. For the parmesan: Place all of the Almond-Pepita Parmesan ingredients into a mini food processor and pulse together until coarsely ground. Transfer the mixture into a zip bag or small container before placing it in the fridge. All three casserole components can be stored in the fridge for 2 to 3 days. When ready to cook the casserole, remove all prepped ingredients from the fridge. Poke a few air holes into the tinfoil covering the casserole dish. Place the covered casserole dish in the oven and bake for about 45 to 50 minutes, until the squash is fork tender. 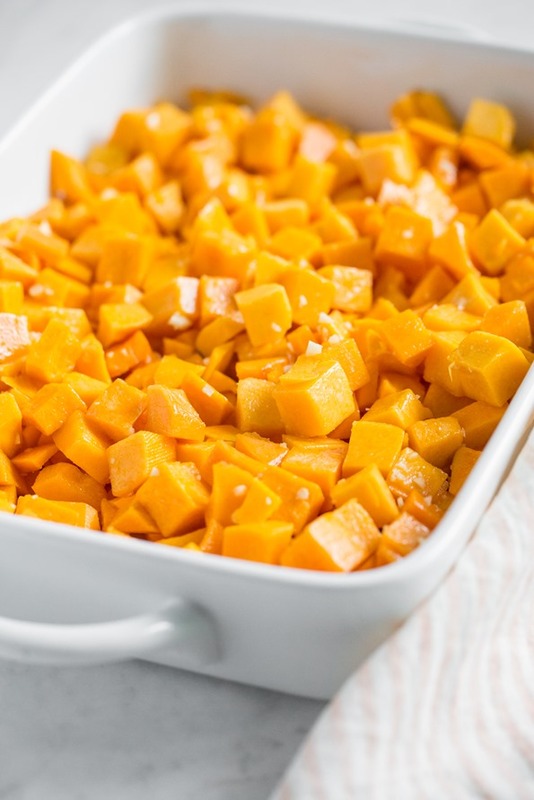 Carefully remove the squash from the oven and reduce heat to 350°F (180°C). Remove the tinfoil (be careful as some steam might escape from the dish as you do). 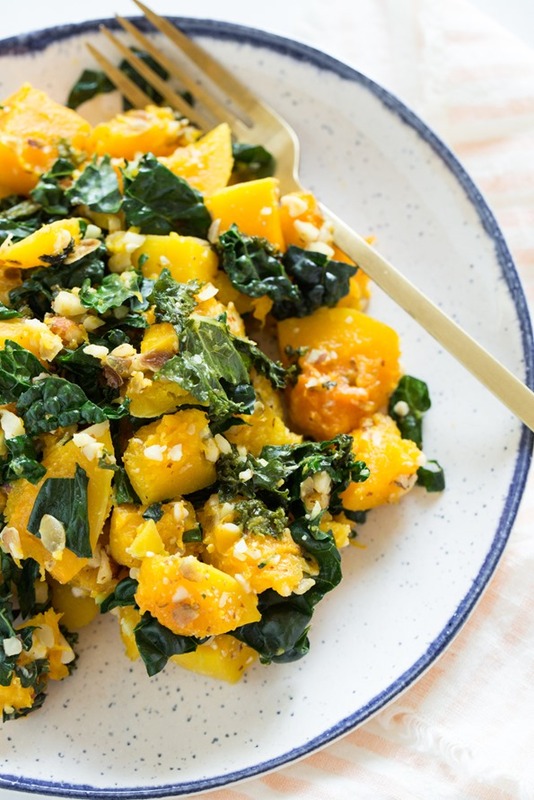 Stir the chopped kale into the squash until combined. Sprinkle all of the parmesan over top of the squash. Bake for another 6 to 10 minutes, uncovered, until the nuts are lightly toasted and the kale has wilted. Watch closely so you don’t burn either the nuts or kale. Serve warm, seasoning with salt and pepper to taste. Leftovers will keep refrigerated in an airtight container for about 5 days. 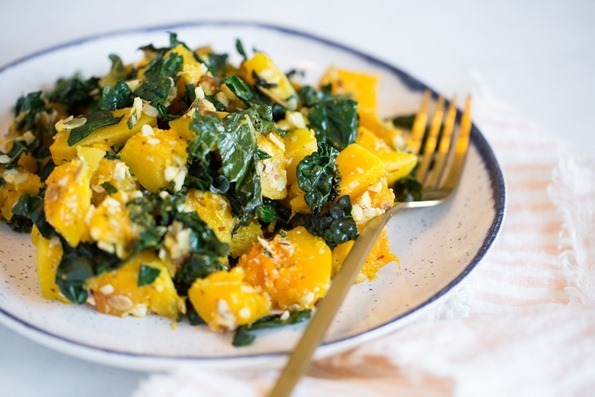 To reheat, simply scoop the squash into an oiled skillet and heat over medium, stirring frequently, until heated through. Season to taste, and enjoy! * I doubled the original amount of kale for extra green power! ** Feel free to swap in any nuts or seeds you prefer! There are endless possibilities. Pecans (which are used in the original version) are lovely, too. MAKE IT NUT-FREE: Swap the almonds for more pepitas. The total bake time your squash requires will depend on how fresh it is, how small you chop the squash, and how hot your oven runs, so you can start checking it after 35 to 40 minutes. 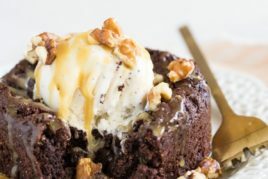 Ultimate flourless brownies for two + Cookbook news! I for one am very happy you posted on your blog. It’s always a wonderful thing to sign on and see a new post! I have both your cookbooks but love the extra tips and reader comments i find on your blog site. Thanks for posting!! I agree! It’s always nice to see all that eye popping color in a new post too. I’m not strictly vegan or even a vegetarian but am moving in that direction!!! Thrilled with butternut squash recipes now. Went to a roadside stand and bought butternut squash weighing 7-9 pounds each for just 75 cents each. I have over $100 of squash in my car trunk right now waiting to be used on recipes like this!!! This looks great! I’ve had my eye out for a butternut squash recipe; can’t wait to try. I hope you enjoy it Connie! Made this today for potluck. Several people wanted the recipe. It was very yum. Hey Clara, I’m thrilled it was a hit at your potluck…thanks for letting us know! OMG, I cannot wait to make this recipe! I have a butternut squash and was looking for inspiration to use it and now I know what I’m going to do. This looks so yummy. Hey Kathy, I can’t see why not! As long as you don’t mind that the spinach will be very soft once cooked (compared to kale having a chewiness to it, even when cooked), it should be fine. Let me know if you try it out! I used spinach in this (can’t digest kale) and it was really good! I did have some issues with this being a bit watery, but I might have just gotten a watery squash. Otherwise it was really good! I had a happy accident when I accidentally doubled all the topping ingredients. 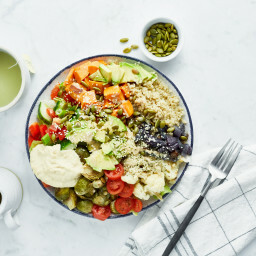 Oops and oh well – more toppings make everything better! Doubling the toppings is always a happy accident! That’s too bad about the watery squash! I haven’t had that problem before (maybe ours are always on the “older” side, haha). I was just thinking to make some squash but couldn’t find a recipe I like. 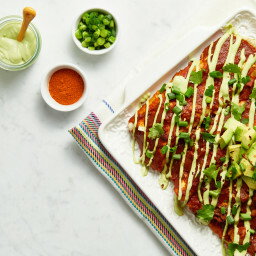 This one looks really easy and delicios. I will most surely do it tonight and I bet will turn out great. Made this last night and was very pleased. Like all your recipes (LOVE your cookbooks), this breaks the mold of boring, flavorless vegan food. The flavor was outstanding. I found the cooking time for the squash a bit too long and would reduce that to 30 next time so it’s a little firmer. I also added about 2 cups of cooked faro for some extra protein and made the “parmesan” with pepitos and pine nuts. So glad I have a lot of leftovers! Nice and normal family for sure! hahahah Loved it, I’ll definitely make this recipe! This is so beautiful – I’m going to try this for my early Thanksgiving party of Saturday! I hope you enjoy it, Alisa! I am loving the streamlined prep/ make ahead focus on your blog! I’m a new mom (well, the babe is 9 months but I’m still learning) and having things mostly prepped well before dinner is a lifesaver (as is your 10-minute pasta recipe…I always keep the ingredients on hand just in case) – thank you! Hey Eleanor, I’m so happy to hear that you’re enjoying these kinds of posts…they definitely reflect a real challenge in my life these days. ;) Congrats on your little one! Thank you Claire! Hope you enjoy it if you make it. We love butternut squash and this was excellent. I must say that because of the high baking temp. I use avocado oil instead of olive oil. I have also made it swapping some of the squash with yams and when I ran out of kale have used spinach. Since we’re not vegan, I have sometimes added parmesan cheese. Every time it’s a bit different and every time it tastes amazing! Hi Lynn, Oh don’t you love when you can change up a recipe and it turns out great each time? I’ve heard from other readers who have used sweet potato and loved it. I need to try this next! Thanks for your review. Looks amazing! Question: have you tried freezing the leftovers? I’m trying to fill a vegan freezer for a very busy med student. She would Love this, but I’m afraid it won’t freeze well. Hey Kathi, I’m sorry I haven’t tried freezing the leftovers before, so I’m not sure. I do find they keep in the fridge for a good 5 days though. Please let me know if you try anything out, and I’ll try to freeze a bit next time I make it to see how it thaws. Delish!!! Easy to make and perfect for a side dish, or added to a quinoa bowl. I LOVE this recipe. Delightfully tasty, easy to make, and satisfying. I more than doubled the greens, and now make the Peppita-Almond-Parmesan on its own for topping on spaghetti squash. This now moves to favorite fall recipes for me – thanks!! Hey Lisa, I’m happy to hear you love this recipe as much as I do! And good call on adding more greens…I love to do that! I think the kale is one of my fave parts. I’ve been making big batches of the parm each week and using it on just about everything (I love it on sautéed kale especially). I’ve got this recipe baking in the oven now! 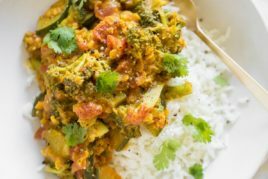 My husband is vegan, and I’ve loved using your app for new dinner recipes. I wanted to say THANK YOU for creating such an awesome website and app. I’ve made the butternut squash sweet potato stew about 4 times in the last month, and everyone (including the picky 9 year old and 18 month old) gobbles it up every time! Aww Rebecca, I can’t thank you enough for your lovely note! So so happy you enjoy the app and blog so much!! Thanks for all your support. This looks delicious! Can I make it a day ahead, refrigerate and then heat up at the potluck dinner? Thanks Patrizia! Do you mean cook it the day before and then reheat it in the casserole dish in the oven the next day? If so, I haven’t tried this yet, but I can’t see why you wouldn’t be able to make it work. If I was going to try it out myself, I would probably bake it for less time on day 1 (maybe 30 minutes?) to avoid drying it out on day 2’s reheat (20 minutes?). Could I swap almond meal for whole almonds, since I have it on hand? Hi Ritu, I can’t see why not! So, this is a stupid question, but there is not any actual parmesan in the topping, right? It’s a pseudo-parm with all the nuts/seeds? Just wanted to make sure! Making this for Thanksgiving! Yes Jill, that’s correct! Thanks for clarifying! I know these vegan names can throw people for a loop sometimes…heh. How much Parmesan??? I missed it…. Where is it written? Oh, I just read the answer from the OTHER JILL! Thank you! I just double checked and the Almond-Pepita Parmesan is in the recipe. :) Let me know if you see it okay! for this dish to side with? Hi Karen, It’s really nice served with my Cheesy Lentil Bolognese Casserole or Crowd-Pleasing Vegan Caesar Salad. I just had this the other week. Sometimes I serve it with one of my soups too. hi angela! i’ve been wanting to make this recipe and have some sage in my fridge to use up — do you think it would be good with sage instead of or in addition to parsley and if so how much would you use? Your family’s comments crack me up! Sounds like my own household! I love one other gal’s idea on using spinach, too – my personal favorite green, although I do love how kale keeps crispy. I’ll have to try both ways! Can i use frozen cubed butternut squash? Hey China, I’d worry that the squash would be too mushy if using cooked and frozen squash. Is that the kind you mean? I’m wondering about using frozen butternut squash that isn’t cooked. Just the cubed frozen kind you can buy? Hi there! It’s fresh :) Some grocery stores have pre-chopped fresh squash in the produce area. That’s what I will buy if I’m crunched for time. I don’t know if frozen would work in this as it could turn out mushy/watery. Do you think this could be cooked and then frozen, or would it get mushy or watery when defrosted? Hey Tanya, I haven’t tried it so I can’t be sure, but I do think it would get watery and mushy after thawing. It looks so delicious and beautiful. Keep Sharing! I heard about one of your recipes that’s spiralized vegetable’s and includes an avocado sauce. Unfortunately I don’t see a search function on your site and haven’t been able to locate it. Would it be possible for you to direct me to that recipe? Hey Lynn, Thanks for reaching out! Is it my Creamy Avocado Pasta by chance? Instead of serving the sauce with pasta noodles, you can use spiralized veggies, like zucchini. Made this for dinner tonight – it was delicious!! We omitted the nutritional yeast because my husband is sensitive to yeast and it was full of flavor anyway. It would be a perfect dish for a special holiday dinner. I’ll likely make it at Easter. Thanks for the recipe! Hey Tara, I’m so glad you tried this one out! And yes it totally works without the nutritional yeast as I’ve done it that way several times before too. 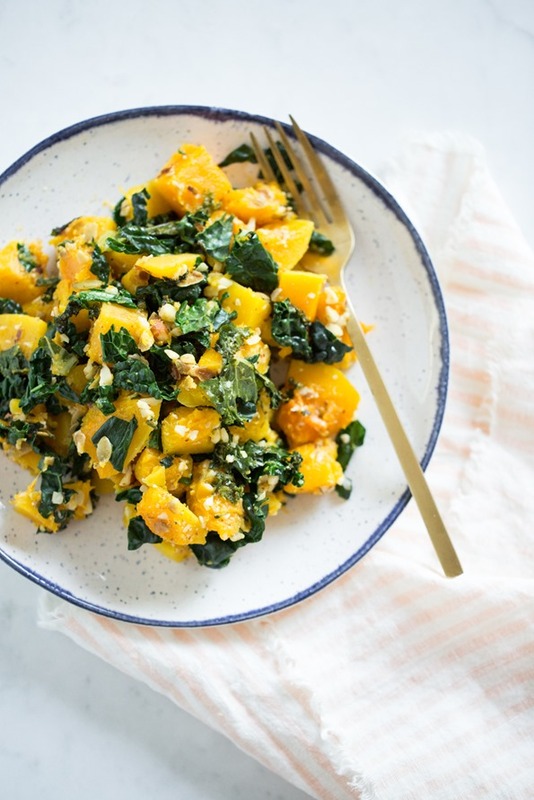 I’m so craving roasted butternut squash this week…think I’ll have to make it too! When I’m lazy I buy the pre-chopped squash from the grocery store, lol. Makes it come together so fast. I just made this and it was absolutely AMAZING!!! thank you so much for sharing this beautiful recipe ! Hey there! It doesn’t have parmesan cheese in it…it’s a dairy-free play on the recipe though (however very different in flavour). Hope this helps! I made this tonight and the only change I made was to the topping. My chopper decided to fail me tonight and made a paste with the original ingredients so I had to start over. Instead of nutritional yeast I used parmesan and added the oil at the end and pulsed it a few times to combine. It was delicious! Just wondering how many cups of squash would you use, IF I were to buy it already chopped and ready to go? I made this two nights in a row…first time for Christmas dinner and the day after for Christmas part 2! The recipe is so fantastic, it will be in regular rotation. Thank you! I just made this and added cauliflower which I had lots of with butternut squash. I swapped out the almonds with hemp hearts. All hail the Kale! I have lots in my garden in beautiful BC (even in the snow). Thanks for a great recipe, will be making it forever. Previous post: Ultimate flourless brownies for two + Cookbook news!